This remarkable picture Hubble Space Telescope photo of a celestial spiral shows one of the most perfect geometrical forms created in space. It captures the formation of an unusual pre-planetary nebula, known as IRAS 23166+1655, around the star LL Pegasi. A photograph of a weirdcosmic spiral in deep space taken by the Hubble Space Telescope is no trick of light ? it's astrophysics in action,scientists say. The photo shows an unusual pre-planetary nebula calledIRAS 23166+1655 as it is forming around the dust-shrouded star LL Pegasi in theconstellation Pegasus. Despite their name, planetarynebulas have nothing to do with planets. The objects earned their namebecause they appear as small diffuse disks instead of individual stars. What makes the Hubble photo stand out is its odd, butthin, spiral pattern winding around the star with unexpected regularity,researchers said. The pattern, which suggests a specific origin for the nebula,is composed of dust and gas streaking outwards at speeds of just over 31,000mph (50,000 kph). The time it takes to create each shell in the spiral is about800 years, astronomers say. The HubbleSpace Telescope observed the cosmic spiral formation several years ago. TheEuropean Space Agency posted the snapshot to its Hubble telescope websiteMonday as the picture of the week. 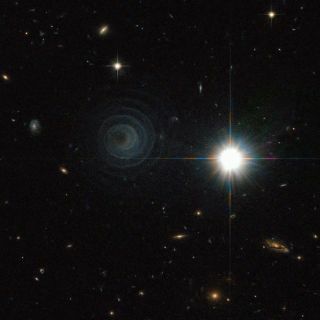 Astronomers think the spiral formed because of the binarynature of LL Pegasi. The star is actually part of a double-starsystem and is losing material to its nearby stellar companion, whichappears to have an orbital period of 800 years ? the same amount of time ittakes to create each of the spiral's shells, they said. Planetary nebulas are created by stars ranging betweenhalf the mass of our sun up to eight solar masses. These stars do not end theirlives in a supernova explosion. Instead, they gradually shed their outer layersof gas over time to create striking structures in space, researchers said. The star IRAS 23166+1655 is "just starting thisprocess and the central star has yet to emerge from the cocoon of envelopingdust," they added. The Hubble Space Telescope is a prolific orbitingobservatory that has spent more than 20 years peering deep into the cosmos. NASA and the European Space Agency have invested some $10billion into the long-lived space telescope, which was launched in April 1990.Astronauts last overhauled the aging telescope in May 2009, to extend theiconic observatory's life by up to 10 years.